Complete your Harley Davidson® themed room with one of our fine quality Harley area rugs. Choose from a great selection of classic Harley Davidson® Motorcycle themes including Flames, Skull & Crossbones, Harley Tank and the Fresh Logo. Don't miss our fabulous Harley Davidson Plush Carved Bar & Shield rug. This is the finest quality, heaviest plush Harley Rug available and was originally sold only in Harley Davidson Dealerships at over $80.00 each...Guaranteed you will love it! Don't be disappointed...order yours today! 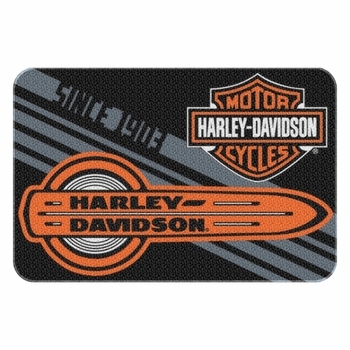 Harley-Davidson Duality Raschel Rug 20" x 30"
This item is currently unavailable! Harley Davidson Plush Carved Rug-Pink 37.5" x 28.5"
Harley-Davidson Racetag Tufted Rug 39" x 59"
Harley-Davidson Build Willie G Skull Piston Tufted Rug 39" x 59"
Harley Davidson "Rev-up" Rug 39" x 59"